Many people ask me which are the best plants to grow in a garden. Out of all the types and varieties that are available, this may seem like asking, 'How long is a piece of string?'! Yet, there are definitely ones that I would recommend, certainly for those just starting out: real beauties that look as if they must be difficult to grow, but are, in fact, very easy. Each has to earn its place in the garden, especially when the garden is small. For me, they must have some outstanding feature to make it onto the list; whether it is colour, form, fragrance, the length of time it flowers, all year interest, hardiness, or because it makes a good background (foil) for other plants. I've included some plant pictures that will hopefully give you lots of ideas for your garden borders, and give you the inspiration to have a go yourself! 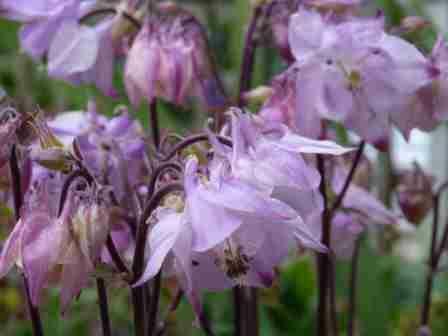 The word 'bulletproof' comes to mind when thinking of species that will grow in the majority of gardens. These types of plants and flowers are difficult to kill by neglect, or by frost! Some in the list are not quite as hardy, but well worth giving a go. I've chosen 25 that should do very well, and give a wonderful display, given a reasonably well-drained soil. These are cut down to ground level each year and appear the next. Although a little more labour intensive than other types, they are so varied, colourful and beautiful that they are worth the extra effort! These cover an area quickly, spreading sideways. They are used to cover bare earth and to supress weeds. Small and low-growing, they are often used to cover the ground between decorative rocks and stones. Some can be used as ground cover too, although they are not generally as vigorous. They are often referred to as alpines. Very useful for adding structure to a garden, as the leaves stay on all year. Some have flowers and some don't. They are interesting mainly for the form they bring. Often referred to as 'Bedding', these are usually grown for one season only. The summer varieties will usually die after the first frost. These plant pictures will hopefully give some ideas and inspiration for the borders and rockeries in your garden. They are some of my personal tried and tested favourites, but that's just what they are: my favourites! There are many other easy to grow species. As you go down the list you may well be thinking that there are others you would include instead. Tell us about your favourite at the end of the list. All can be found (with lots of detailed information on height and spread, care and planting combinations) here. Just type the name in the search box and away you go. I'm starting off with the campanulas, mainly because they come in so many different sizes and forms, they can be used in many different ways and all are really easy to grow. Here are some examples of their beautiful form and colour. 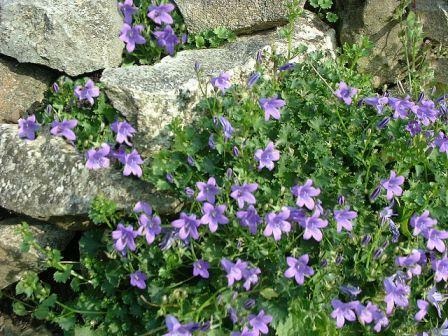 This is the gorgeous campanula portenschlagiana, seen here growing on a rockery. It has the most vivid purple flowers and evergreen foliage. It can be used as a rockery plant, as ground cover, in pots and planters, and as border edging. Team up with other deep-pink, pale-pink, white and lime-green flowers for a lovely display. 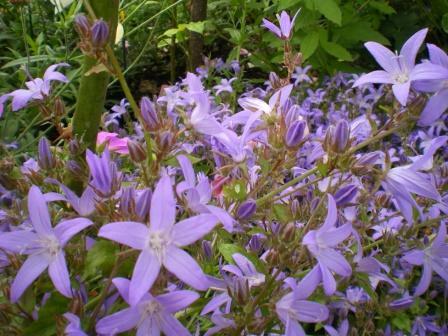 A wonderful campanula for edging and ground cover, campanula poscharskyana also has evergreen foliage. It grows faster than the previous one, and is bigger. You will only need to buy one of each of these campanulas, as a small part can be easily dug up and transplanted elsewhere. 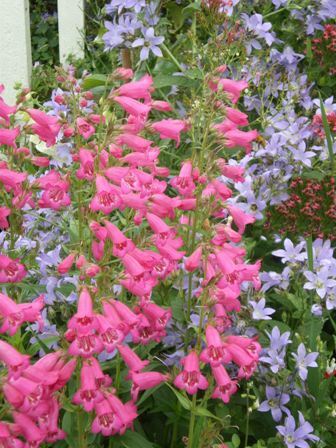 Grouped here with a pink penstemon, the two make a stunning display. 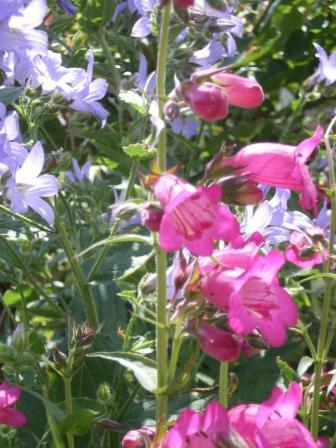 The rich purple of campanula 'Pritchard's Variety' goes well with so many different flowers. It's tall spires are densely packed with delicate star-shaped purple blooms. Behind, you can just see the deep-pink centranthus peeping through, giving even more contrast to this lovely border display. An even larger, pink variety is 'Lodden Anna'. 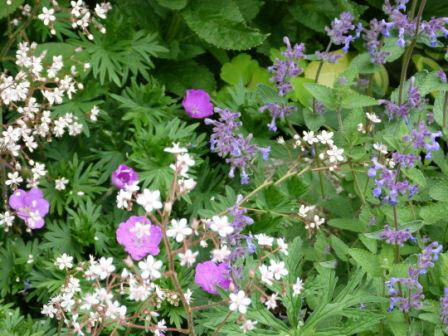 Both are fabulous to grow in a cottage garden or perennial border. Being perennial, these wonderful flowers are cut down each autumn, only to amaze us with their beauty the following year. 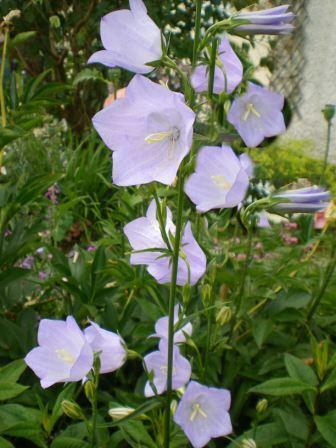 And lastly we have campanula persicifolia, which is another of the tall perennial varieties. This will spread through the garden border of its own accord. It comes in pale blue (as seen here), a deeper blue and white. Just lovely! There are so many different campanula varieties to choose from, but these are paricularly hardy, versatile and delicately beautiful. What more could we ask?! Next come the geranuims: another plant species that certainly earns its place in the garden. They are so versatile, easy to grow, and flower at different times of the season. Some are small and compact, others larger and bold, some spead, others are clump forming, and then there are the wonderful trailing geraniums which look great in pots and planters (a particular trailing favourite of mine being 'Rozanne'). 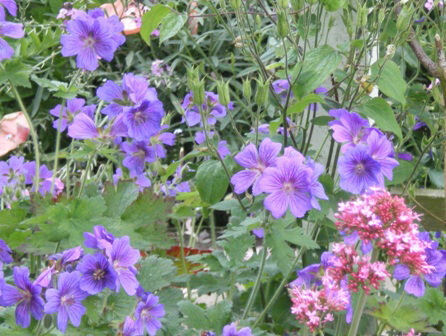 This is geranium sanguineum, one of the most versatile and long-flowering varieties. Here, it is peeping through the foamy, lavender spires of nepeta (cat mint) and the pinky-white flowering stems of 'London Pride'. 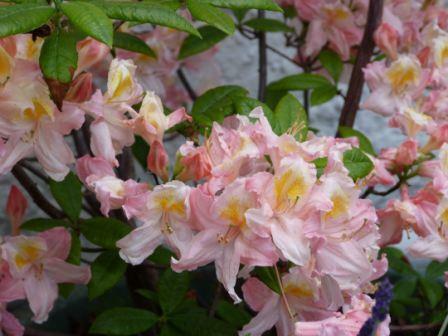 Two particularly good features of this variety are, firstly, its tolerance of shady areas, so it can provide much-needed, vibrant colour 'where the sun don't shine', and secondly, at dusk, the colour takes on a wonderful luminescence. Geranuim grandiflorum has a shorter flowering period but it is really the most striking and beautiful blue. Here you can see it growing with the deep-pink of the centranthus. Geraniums are very easy to grow (don't confuse them with the annual geranuims which are seen each summer in pots and hanging baskets: they are really pelargoniums). Geraniums come in many varieties and colours; some with really exquisite markings. Very reliable and free-flowering. 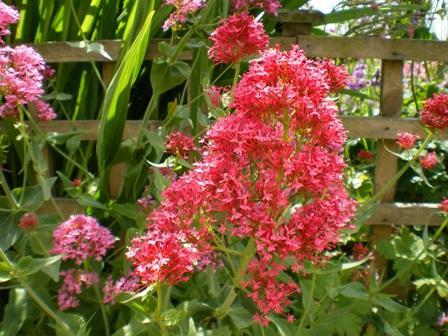 Let's take a look at centranthus, as we've mentioned this before. I absolutely love deep pink flowers. They go so well with so many other colours, especially pale pink, violet, purple, white and lime green. Often called 'Valerian', its flowering stem is a fabulous colour and it is very reliable (I'd defy anyone to unintentionally kill it!). It not only looks great in a border, mingling with other flowers, but also also running down the edge of a border, wall or fence. 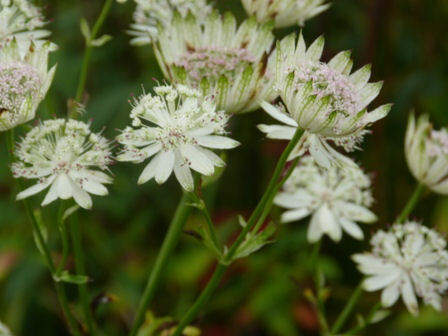 This is a relatively new find, as there are more widely available varieties of astrantia than this one. The distinctive pincushion heads of this plant species are large and bold, especially good placed in front of dark green foliage. The gorgeous cream flowers are much admired in my garden. It's one of the bigger varieties astrantia 'Large White', growing to about mid-thigh height, and seems to grow happily wherever it's placed, producing little seedlings that can be transplanted throughout the border. 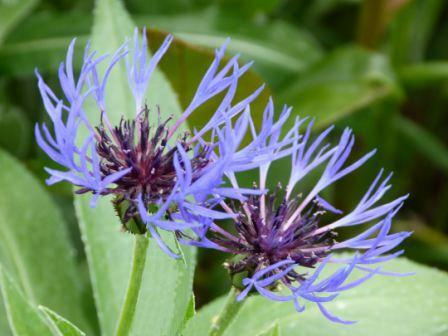 Centaurea is commonly known as the cornflower, but this one is the perennial variety and was one of the first flowers I ever planted in my garden. I just love the amazing form and colour! What a beauty! Cut down when the flowers begin to fade and it will reward you with another flowering later on. It's vigorous , so do be careful to remove any seedlings that you don't want while they are still small. It will do well in both sunny and shaded areas. 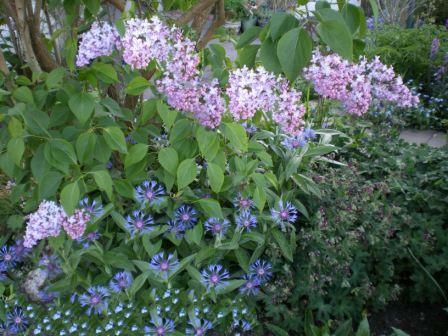 Here it is growing freely under a lilac, with forget-me-nots, and the shade-loving, deep maroon flowers of geranium pheum. All pick out and compliment the colour of the others, enhancing the overall effect. This poppy is breathtaking. It flowers for a good length of time, and puts on a much bigger show than the size of the foliage might suggest. I have a real 'thing' about salmon/coral pink! 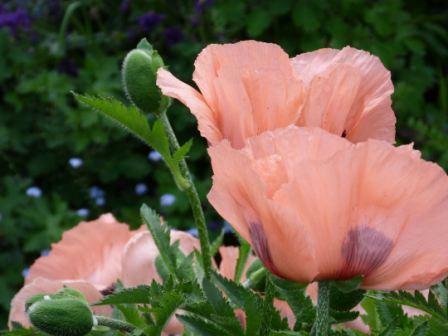 This delicate, yet vigorous, poppy definitely has the 'Wow' factor. Easy to grow and propogate from seed, it is certainly a stunner. Here is the orange variety, which looks great with purples and blues. 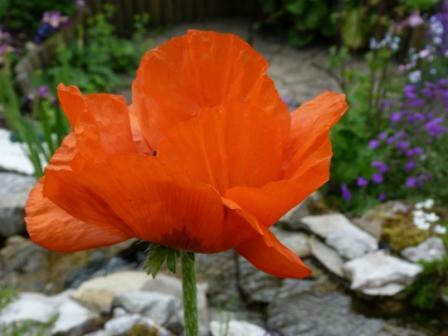 In the background you can see the lovely purple aubretia growing with the poppy next to the waterfall and stream. The orange variety doesn't flower as long, and isn't as dense as the pink variety, but still very beautiful. Another species, that will readily spread, is the iris. And how gorgeous it is too, with beautiful form and delicate markings. 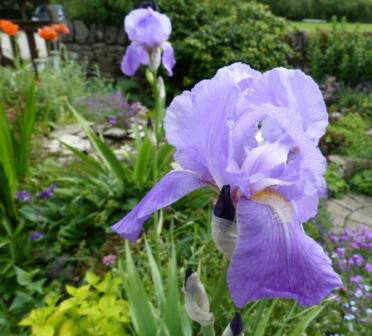 Think of iris in two groups, or types: the large bearded iris, which is bigger, and likes it feet in the baking sun (always plant with the rhizome sitting on top of the soil), and the siberian iris, which thrives in moist soils, or even standing in water. This is a beautiful, violet bearded iris. Notice how well it goes with the orange poppies and zingy-green foliage. 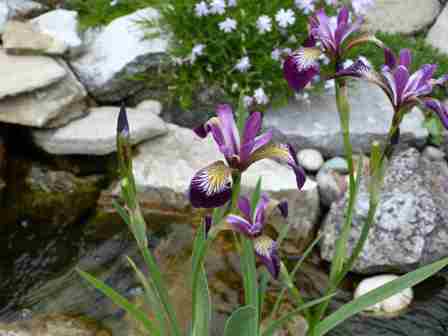 Here is a siberian iris growing, without soil, in the water of the stream. These are real show stoppers. Some are evergreen and others deciduous (lose their leaves in the winter). All are wonderfully rich and vibrant. It's important to remember that they like an acid soil (ericaceous). Don't worry if your soil is alkiline: just plant in large pots and planters that have been filled with ericaceous compost. Both of these are grown in containers. You can stand the containers on patios, or even within a border. This is my deep pink rhododendron, which stands in a half barrel on the patio. I just feed it with acid/ericaceous fertilizer once a year and it rewards me with these gorgeous flowers. 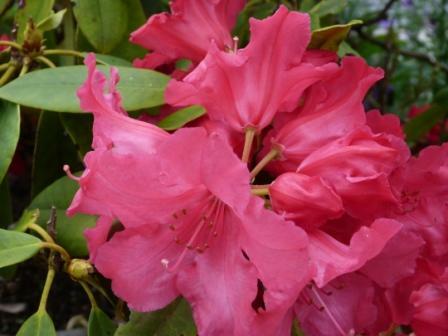 Rhododendrons don't like their roots too deep, so bear this in mind when digging the hole. Here is a deciduous azalea, which can grow into quite a large shrub, with tall stems bearing a profusion of vividly-coloured blooms. These are slightly different to the clump-forming evergreen azaleas that we often see in garden centres and stores. The colours are truly amazing! Use the correct compost and this is what you get. 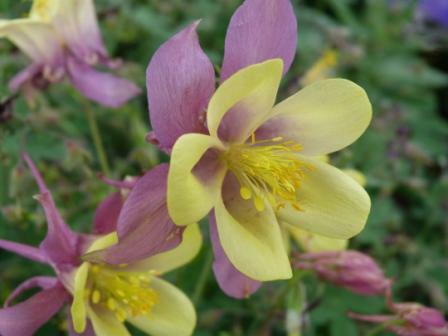 Next we have the aquilegia, with its many lovely colour combinations. It's so easy to grow, and will multiply freely. If you don't want too many in the border, they are easy to just pull out. This is one of the more cultivated types, which tend to be more showy than the more common varieties. How beautiful is that?! The next two are what I call the more bog standard type, but they are sturdier, more free-flowering and provide swathes of colour in a border. Very useful! 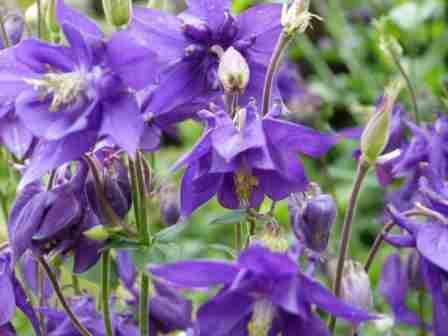 They flower for a very long time, through spring, well into summer, and look lovely in a cottage garden. As far as feature plants go, crocosmia 'Lucifer' is up there at the top. It's long branching flowers look almost sculpted, and the vivid, fiery red makes it really stand out in the crowd. 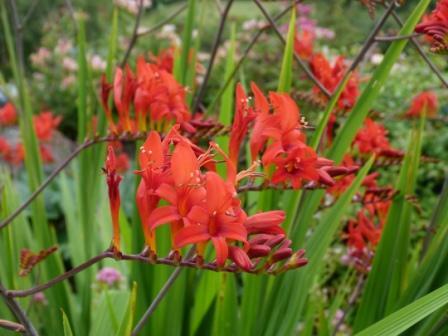 Crocosmia tends to form a round clump, with the stems curving out at the top. It's hard to believe that this wonderfully rich and impressive specimen sprouted from a few bulbs. Often listed as frost hardy, it survived the -25 degree freezing temperatures during the winter of early 2011, and it is not in a particularly sheltered position! Now that is what I call bulletproof!